What is Orgonite? Orgonite is a combination of resin, metal filings, and crystals, that are put together in different shapes and sizes to disperse negative or harmful psychic energies and to raise positive energies in their place. I have a number of Orgone devices placed around my home, and recommend them to clients who have suffered from repeated unwelcome psychic experiences as an alternative to plain quartz crystal. I find they are more grounding than crystals on their own. You can make your own orgonite. There are a number of online groups and small companies who are willing to teach you how to make it. This is my favorite site on orgonite so far. Keep in mind, the ingredients can be costly to experiment with, and the resin and metal filings can be toxic and unhealthy if not handled correctly. 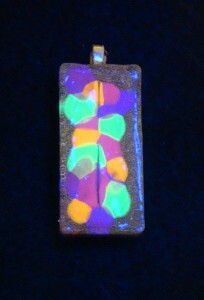 This tile-shaped pendant glows brightly under black light (Second picture shows the pendant under black light). 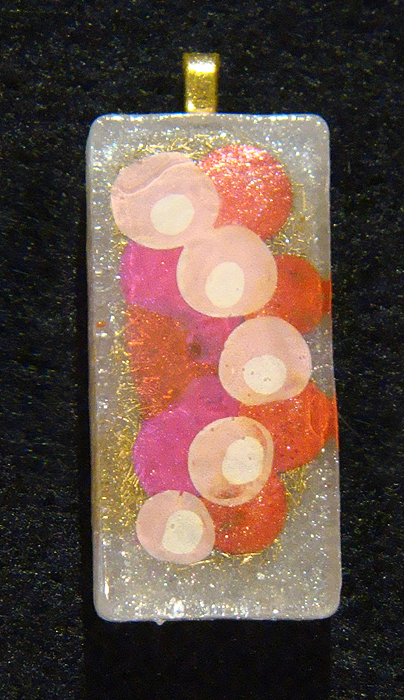 It contains a single quartz crystal, metal shavings and is hand-painted with black-light reactant patterns in pink, orange and yellow. $30.00, includes shipping in US and Canada. If you are outside of the USA or Canada, please email us in advance to request a price estimate for shipping. Does not include a chain, pendant price only. This tile-shaped pendant contains a single quartz crystal, metal shavings and is hand-painted in pink, peach, orange and white dots. $30.00, includes shipping in US and Canada. If you are outside of the USA or Canada, please email us in advance to request a price estimate for shipping. 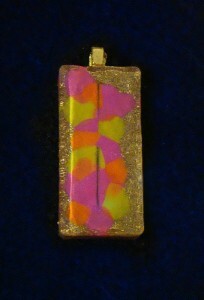 Does not include a chain, pendant price only.